"MAKE SURE YOU'RE CONNECTED". Stereo MC's.1992. I first wrote and posted the blog below in June 2012. That was a time before David Attenborough came down off his environmental fence in order to talk frankly about the horrible realities of climate change, plastic pollution and mass extinction. Back then no pope had publicly spoken about the inherent ‘growth’ flaw in our economic system and the detrimental effect it would have on the ecological balance of our planet. The United Nations weren’t predicting climate breakdown and critical biodiversity loss, and our own government was nowhere near making ‘net ecological gains’ mandatory objectives for developers and constructors of the built environment. In 2012, for the most part, the mainstream media assured us everything was just fine, it wasn’t…trouble was already well on its way! BY NIGEL GEORGE. WRITTEN ONE SUNNY DAY IN JUNE 2012. The next line of the rap song after which my blog here is entitled is…..”But if your mind's neglected, Stumble you might fall”. When I was a kid I spent hour upon hour in the garden of my home on my knees or lying flat on the ground face down. The reason for this behaviour wasn't the result of childhood narcolepsy or fainting fits, it was simply that this was the best way to get close to the world of nature that was under my feet. You see I was one of those kids who noticed that the world around them is full of things that have more legs than them or for that matter - wings, jaws, stings, compound eyes, feathers, fur, scales, slime etc etc, in short I was one of those kids who was fascinated by the natural world that surrounded them. This passion for living things started before I can remember. By the time I was 6 or 7 years old it had led to an encyclopedic knowledge of the natural world. Whilst everything that walked, flew, grew and swam interested me it was the invertebrates that really captured my imagination. From the earliest age perhaps 4 or 5 years old I realised that the front and back gardens of my family home were as exciting and awe inspiring as the Serengeti or the Amazon basin, you just needed to get down on your hands and knees to see it, and when you did there was a wilderness laid out before you in all its glorious technicolour and high definition reality. As a child I watched Violet Ground Beetle's hunting slugs, I saw Hornets ambushing honey bees and I witnessed mesmerised male Speckled Wood butterflies as they were entranced by the pheromones of a female Speckled Wood butterfly...I saw these things and lots more unbelievable happenings around my home, all in the first handful of years of my life. By the time I was 8 or 9 years old my passion had developed from an interest in individual species, learning their names and observing their habits etc, to becoming totally gripped by the astonishing relationships between organisms. Gradually I became absorbed by the spaces between animals and the relationships that filled these spaces, same species to same species connections, cross species relationships, symbiotic, parasitic and so on. The sheer expanse of relationships seemed to create an endless interplay of living things, often dramatic but more often beautifully subtle. It was around this time that I realised that all of these amazing creatures I had seen in my own back garden were defined not by the way they looked but instead by their relationships with each other and their surroundings. When eventually I was lucky enough to work in zoology in my late teens and early twenties, it was this 'connectivity' that became the driver for my interest at my family's own zoological project called 'Little Amazon'. In 1987 we built a simulated rainforest, a ridiculously ambitious project that was an attempt to show a diverse fauna and flora collection to visitors in a way that maintained connections between the exotic inhabitants and the environment in which they lived. I remember very clearly thinking that a hummingbird in a cage might as well be a frog as far as it or anybody looking at it is concerned, a hummingbird in 4000 sq ft of simulated rainforest on the other hand is definitely a hummingbird to itself and anyone who sees it. Don't get me started on hummingbirds but suffice to say I've been very lucky to witness the most unbelievable displays of interrelationship behaviour in a artificial simulated rainforest environment, more astounding and beautiful than you can imagine, hummingbirds are great! This family project taught me many important lessons about the natural world and how some of it’s intricacies work. In short it helped me to understand things in a way that had escaped me previously. It became clear to me that every living thing that calls this planet home be it animal, plant or fungi, is what it is not because of it's type but because of the relationships it maintains with the other animals, plants and objects around it. A thing is only a particular thing in relation to another thing…sort of thing!! When, like me, you've spent far too much time puzzling over the myriad of connections and relationships that make up the natural world it's not all that long before you start to look at your fellow human beings and wonder where we, so called, civilised apes fit in to all this. It takes an even shorter time to figure out that as far as most of our kind are concerned we don't fit in at all, indeed unless you happen to be from an uncontacted native tribe or something, the chances are your relationship with, lets say earwigs for example, extend to one of revulsion followed up with a swift bout of annihilation executed with little or nothing in the way of consideration or apology. The really sad thing is that this ‘earwigism’ represents a very one sided case of disregard on your part, the ultimate unrequited relationship you could say, since the earwig believes you to be the best thing since the invention of the pliers on her bum. You see the earwig has moved in with you as a matter of choice, she wanted to be connected to you, she sought you out because you provided her with warmth, shelter and food. She gave birth right under your feet in the tiny damp crack in your skirting board and then nurtured her young with the nutritious crumbs you unwittingly provided until they were two molts old at which point they set off to make lives of their own. She chose a relationship with you because she felt some security in your presence and that gave her an opportunity to survive and prosper. She even provided you with a very useful service in exchange because as well as scavenging your food scraps she merrily munched on fleas and mites and even the eggs of other less friendly invertebrates. And that's how it was for Mrs Earwig, right up until you saw her for the first time, exclaimed yuk and stamped on her. Of course I’m using this sad tale of earwig disconnection as a metaphor for the sort of relationship our own species has with our home planet. There has been a lot of metaphorical stamping going on as a result of not understanding our place in the big scheme of natural things, and now along with the earwigs our planetary home has just about had enough of us. I think we now have to try really hard to understand that the real truth of the matter is that we do fit in with the natural world after all, lopsided it may be at the moment but we’re still in a relationship for sure and it’s one we literally depend on for our lives. Our homes both inside and out are shared homes with a multitude of wild lives, from fungi to mammals and every living thing in between. It seems to me that sooner we embrace this as the actual reality the better for everyone and every thing, because until we all understand our connection with our environment, until we embrace our relationships and dependencies within the natural world and until we understand the space we occupy between other lifeforms, we humans might as consider ourselves as earwigs and as such be prepared to be stamped on by mother nature herself. Of course if one thing is for certain it's not middle-aged Planet Earth that's in danger of demise it's us human beings, our planetary home has seen it all before and has shown to have a wonderful ability to start again when things go a bit awry.......there's still plenty of time for Earth start again quite a few times over, I image next time round we might be left out of any plans for renewal. So, I'm pretty sure that it's not the things us humans have accomplished so far that will define us, it's our relationship to the rest of the natural world and our understanding of it that holds the key to who we are and where we're going. Some are already saying that the future for us is bleak, that may or may not be true but I suggest that wherever you place your faith, you get down on your knees sometime soon and say a little prayer for the well being of the human race and while you're down there take a look at the wondrous creatures playing out their lives right alongside yours....look close enough and you'll be surprised at the kind of enlightenment they’ll bring you. 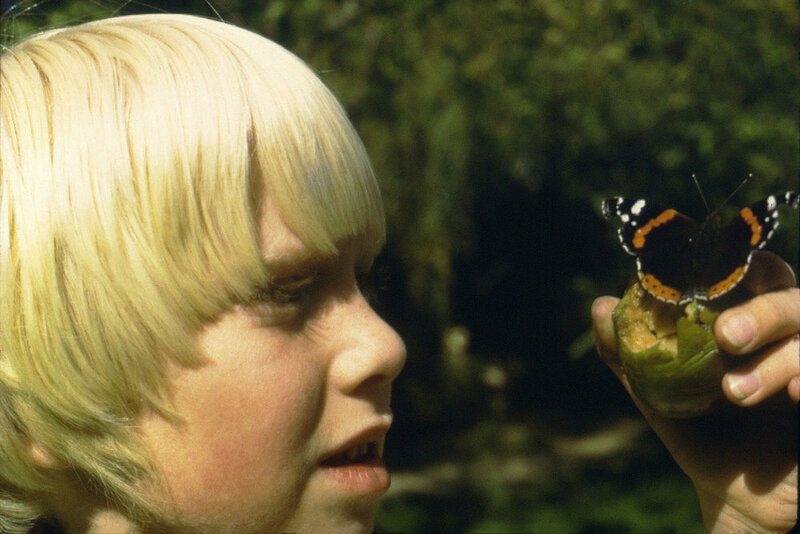 Oh and yes that’s me in the photo, 1974 a great year for Red Admiral butterflies as I recall.